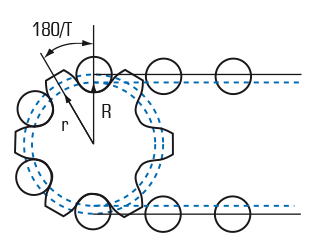 Chain speed, normally calculated in feet or metres per minute, is a critical consideration in determining the conveyor capacity. It is in considering this parameter that conveyor chain pitch and conveyor chain drive and idler sprocket can be determined. fig. 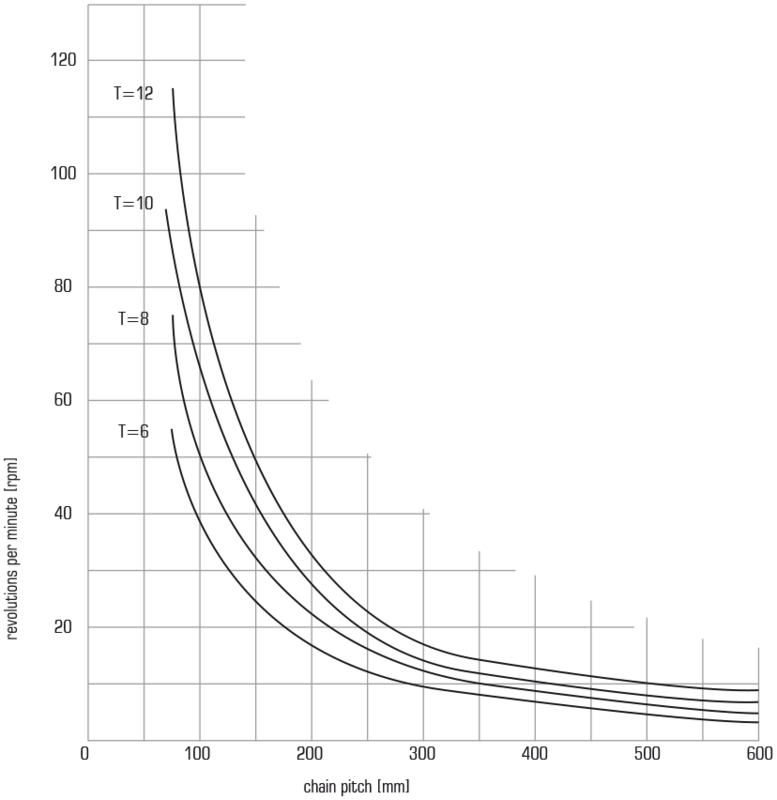 5.1 illustrates the relationship between speed, chain pitch and sprocket size. The maximum recommended conveyor will be up to 30 metres (100 feet)/minute. 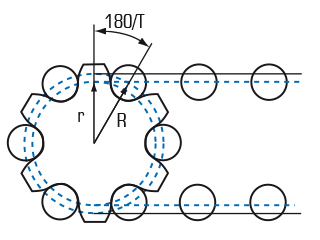 Chain speed is a critical influence in smooth conveyor chain operation and extended service life. Too high speeds can create the condition of pulsing or surging which can seriously compromise conveyor chain performance. 5.1 Intermittent contact between chain and track guides creating variations in friction factor and pulsing. This can be controlled by reducing chain speed. 5.2 Low Conveyor chain speed can create a similar effect. 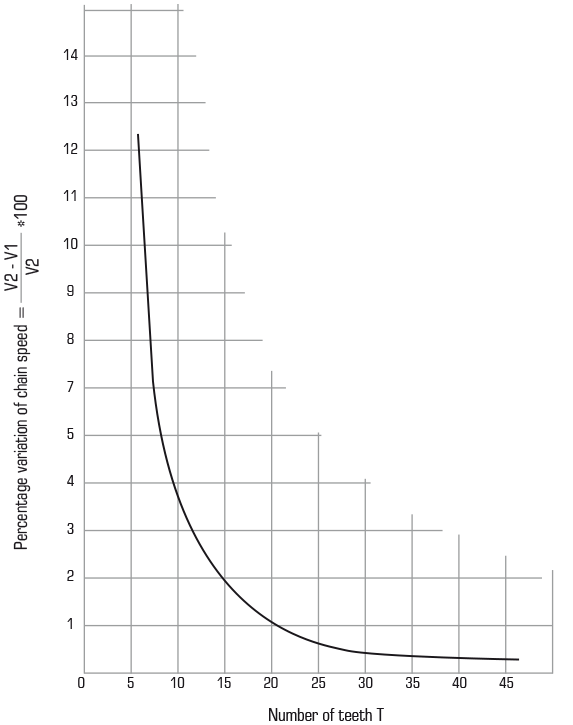 Typically speed below 3 metres (10 feet)/minute. 5.3 Excessive friction due to the condition of the chain and wear strips. This could be the result of contaminants or general wear in mating components within the system. 5.4 The polygonal effect in considering the relationship of the chain and sprockets (see fig 5.4).This can be particularly prevalent on long pitch chains and small diameter sprockets. The designer must take care to ensure compatibility between chain pitch and sprocket diameter to establish smooth chordal action. 5.5 Uneven loading on the conveyor will also influence the condition. In some case this is unavoidable, but must therefore be taken into account in the process of chain selection to ensure correct parameters are established. 5.6 ”Slip Stick” will be seen on roller conveyors running at slow speed. This is often the result of over lubrication between roller and wear strip. The friction factor is reduced to the point where friction is greater than bush and roller bore. The roller stops turning. The intermittent condition of roller rotation and skid causes the chain speed to fluctuate. This condition is slip stick. It tends to occur on lighter conveyors since heavier loads will tend to increase bearing pressure and thus friction which will encourage roller rotation. This can often be a route to a solution if this condition is encountered. 5.7 Very long conveyors which become difficult to tension or are subject to varying operational conditions can also be subject to pulsing or surging. The designer needs to make additional considerations for conveyors over 80 metres(250 feet).